With the Dubai Tour having just finished and the Tour of Qatar in full flow, what better time to take a look at the races in the UAE, Qatar and Oman. 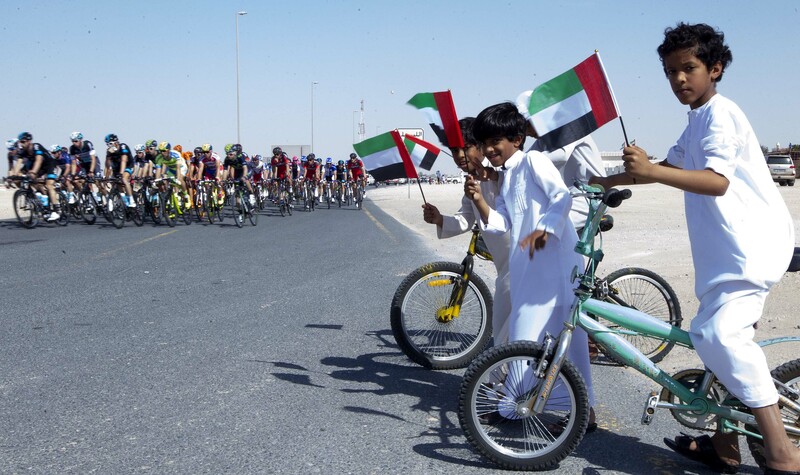 While cycling through the desert to a sprint finish may not be everyone’s idea of an exciting bike race, these races in oil and gas-rich Eastern Arabia are increasing in profile and importance every year. Another race is on its way too – the Abu Dhabi Tour will be run for the first time in mid-October. 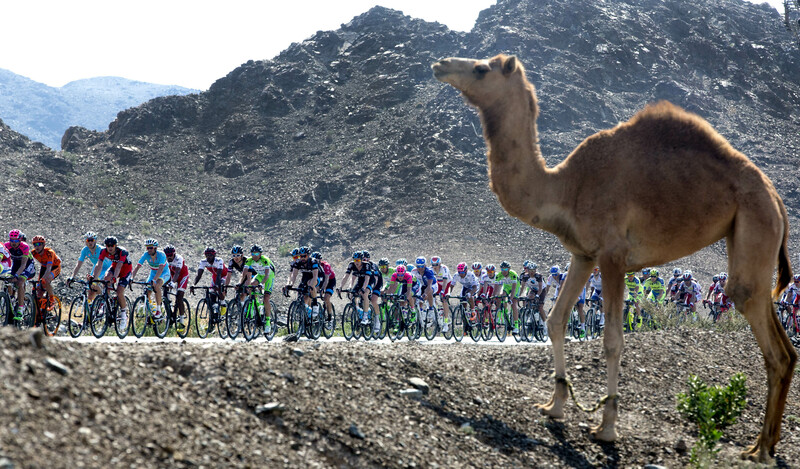 It will join the Dubai Tour in Giro d’Italia organiser RCS’s portfolio, while the ASO run the Tours of Qatar and Oman. So what are these races giving to the cycling world, and what do the countries gain from staging them? Obviously this is the first thing that comes to mind. 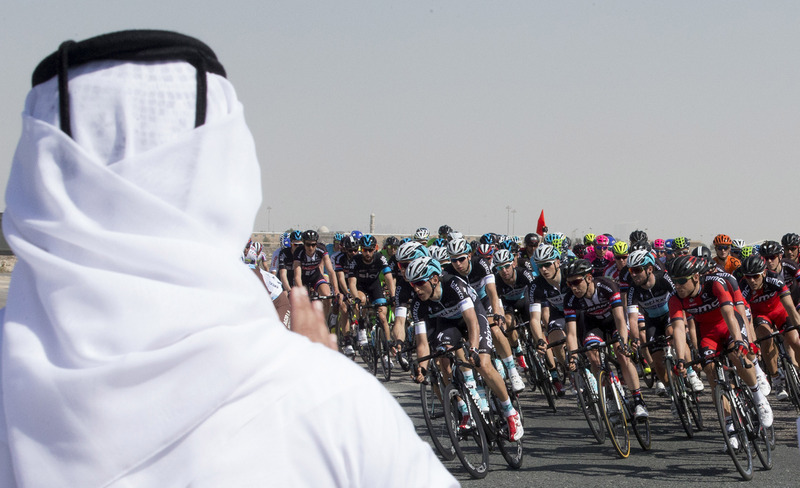 The vast oil and gas reserves that give Qatar the highest GDP per capita in the world and the UAE the second-largest economy in the Arab world mean that there’s more than enough to stage a top class bike race. These races are polar opposites to the independently-run and locally-sponsored races that we have seen fold thanks to economic hardship in Italy and Spain. While some European races struggle with basic costs such as policing there are no such problems on the Arabian peninsula. Large appearance fees can be paid, while five-star hotels for teams and media are a stark contrast to European chain motels. Likewise, wide newly-built roads offer a comparatively pleasant and safer experience for riders more used to dodging potholes and street furniture. For example, a team like Cofidis can try out it’s new sprint train in competition without having to worry about late corners or fighting over narrow roads. The desert crosswinds also offer a handy training opportunity for the Spring Classics. Another reason to head east is the weather. Sure, Andalucia and the Algarve are better destinations than northern Europe at this time of the year, but Qatar and the UAE are a totally different story. These races give the peloton a last chance of racing in sunny climes before the damp, cold European spring. That’s not to say that these races have everything going for them though, as a week of flat stages isn’t for everyone. Alberto Contador, Chris Froome and Nairo Quintana have stayed in Europe, with the trio facing off for the first time at the hilly Vuelta a Andalucia. On the other hand, Vincenzo Nibali, Thibaut Pinot and Alejandro Valverde will be at the Tour of Oman, with its decisive Green Mountain stage finish. Nibali and Valverde have already raced the Dubai Tour, with Italian organiser RCS likely to have persuaded the Tour de France champion. An additional note – races in far flung destinations such as these give sponsors additional exposure. The expansion of the sport in the region also brings the possibility of new sponsors joining the sport, something which is badly needed. The lack of hills is something that a lot of fans voice displeasure about. The Dubai Tour and the Tour of Qatar are almost exclusively flat, with only stage three of the Dubai Tour containing hills of any description. Neither race provides any particularly exciting racing before the final kilometres, with the GC usually decided by bonus seconds and, in the case of the Tour of Qatar, the time trial. Oman is more blessed geographically. The summit finish of Jebel Akhdar (Green Mountain) has been a fixture of the race since 2011 and usually decides the winner, while other stages also include lumps. The hilly finishing circuit on the stage to the Ministry of Housing is another fixture in the race. A lack of fans at the roadside is another well-worn complaint, with scarcely a soul by the road in Qatar and Dubai. Once again, the Tour of Oman is better off in this regard, but of course doesn’t compare to equivalent races in Europe and the Americas. Why do they want cycling? The Gulf states have also made their presence felt in other sports – football being a prime example with the fortunes of Paris Saint-Germain and Manchester City having been transformed under the ownership of the Qatari state and the Abu Dhabi Royal Family respectively. Qatar will host the World Cup, after FIFA awarded the event to country under some rather shady circumstances. Another sport majorly involved with the region is Formula 1, which runs races in Bahrain and the UAE and is likely to add a race in Qatar soon. Sharia law is administered in Qatar and the UAE with Oman the only country that doesn’t punish lawbreakers with amputations, stoning and flogging. However, all three have been criticised for their human rights records, including the use of forced labour. Issues like these have rarely been brought up in the cycling world. Indeed, the main objections to the upcoming 2016 World Championships in Qatar seem to be about the course and how few spectators will turn up. Compare and contrast to the football world’s reaction to the awarding of the World Cup to the country. In any case, with three races established on the calendar and one more coming it seems the time for protest is long gone. This October will see the first running of the Abu Dhabi Tour. It’ll last for four days and comes at the very end of the season, with the final day coinciding with Paris-Tours. The quality of field we will see is still unknown but going by the other races it is likely that we will see some big names ending their season in the sun. Whether RCS can persuade riders to forgo the Sprinter’s Classic, a race which has already lost some of the prestige it once had, and race in the UAE is another matter. 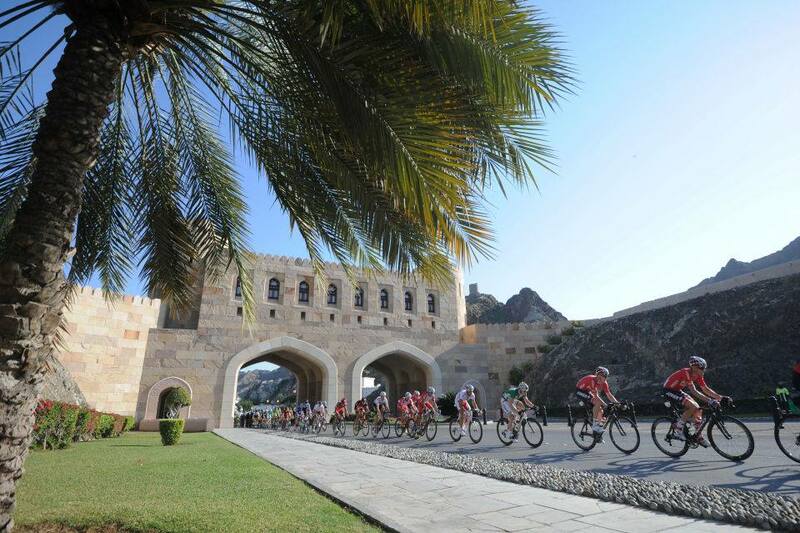 Joining the WorldTour is an aim that the organisers of the Dubai Tour are working towards. The chairman of the organising committee, Saeed Hareb, said a few days ago that 2017 is the aim, and also that they would like to expand to up to ten or twelve stages. A ten-day stage race without any hills doesn’t sound particularly enticing, but moving the 2.HC-rated race up to the WorldTour would be welcome, as that would ensure a filling of the month-long gap between the Tour Down Under and Paris-Nice. 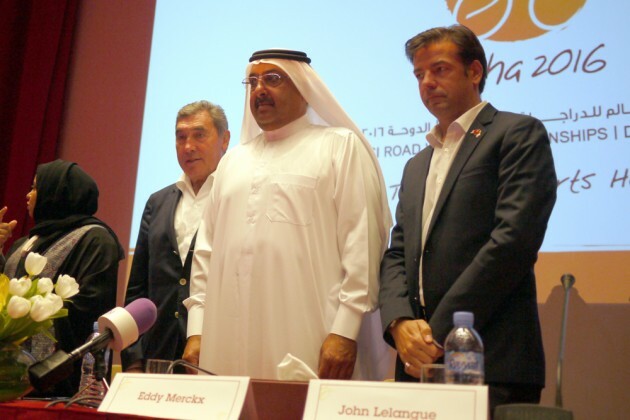 The big event to look forward to is the 2016 World Championships, which will be held in Qatar. It will be held later than usual (9-16th October), when the weather is somewhat cooler. The Eddy Merckx-designed route was unveiled last week – it’s flat and will consist of an 80km loop through the desert before ending with circuits in Doha city centre. A kilometre of cobbles feature along the way, before the race ends on a 2km long straight. Sport is globalising and cycling is no exception. While the Chinese experiment might have been a failure, racing in the Gulf states looks like it’s here to stay. There will always be debate about how interesting the action is, and much-loved European races will inevitably fall by the wayside while races with better organisation and more money prosper. The addition of new races to the calendar is hard to complain about though, and we can only hope that they attract more attention to the sport and in turn more sponsorship.